SeaDream Yacht Club is an innovative, new yachting company that operates the twin, ultra-luxury mega yachts SeaDream I and SeaDream II. Since their introduction in September 2001, they have become the prototypes of the casual and intimate yachting experience. SeaDream Yacht Club has built upon this legacy and today the two sleek and stylish SeaDream yachts are highly acclaimed by discerning travelers seeking a unique seagoing experience and by travel industry observers worldwide. Flexible Schedules and Itineraries — Basically, SeaDream I and II sail on scheduled, seven-day itineraries. 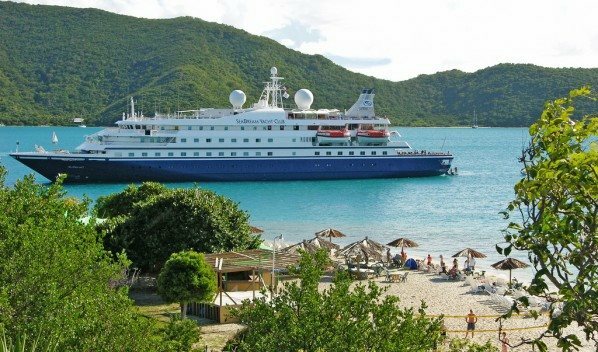 Nevertheless, although SeaDream yachts depart their first port of call and arrive at their last port of call as scheduled, arrivals and departures at intermediate ports are not necessarily, cast in stone. Our Captains have the authority to adjust for local opportunities. Our yachts can make unscheduled calls at small ports to visit a local fish market, for example, or remain longer than scheduled in a secluded bay so guests can enjoy a few more hours of water sports. Overnighting in Key Ports — Unlike cruise ships that usually arrive at ports of call in the early morning and depart in the evening of the same day, SeaDream yachts overnight at many ports of call. You will find many examples when you go into the itinerary section of our website. However, let us give you just a couple of examples here: One port in the Caribbean where we overnight is Gustavia on the French island, St. Barts. When we sail in the Mediterranean, we frequently overnight in St. Tropez in the French Riviera. We know that in some ports of call the action does not even get started until late in the evening and we have found that our guests are active people who do not want to miss a thing. No Tux for Guys, No Gala Gowns for Gals — The SeaDream yachting experience is casually elegant. There is no formal dress code. When asked about what our guests wear during the day or in the evening, we always respond by using the phrase "Resort Casual"--- sportswear for the activity of your choice, easy to wear and comfortable attire for shore-side visits and casually elegant resort wear for evening. Wellness and Well-Being — for both body and mind are high priorities with our guests and a concept that we at SeaDream take very seriously. SeaDream's Spa and Fitness Center provides a highly trained staff in a peaceful and relaxing environment. Our Spa is exclusive in that it is listed together with some of the leading spas in the world with the Thai Spa Association and we are the only one of its kind at sea. The Fitness Center with ocean views, features treadmills, elliptical machines, recumbent bikes, and free weights all with flat screen TVs and DVD players. Tai Chi and yoga on deck are available as requested by guests. There is also a hair and nail salon. Guests will also find a well-equipped medical facility aboard both our yachts and a licensed, highly trained physician on all of our voyages. The Golf Simulator — On SeaDream, guests are able to play 30 championship courses on our state-of-the-art Golf Simulator. Additionally, we have a partnership with the renowned Orlimar Golf Company, creator of the famed Orlimar Golf Clubs and other fine golfing equipment. Guests who wish to purchase Orlimar Clubs aboard after trying them out with the simulator may do so; the purchase will be drop-shipped directly from the factory. Our Activities Directors can also assist guests in arranging tee times at golf courses in our ports-of-call. The Caviar and Champagne SplashTM — We use the word "Splash" advisedly. Ashore, on secluded beaches guests and crew toast and celebrate the great times they have experienced on their voyage. In addition, there is a beach barbecue or picnic. On voyages where it is not possible to host our Champagne and Caviar Splash ashore, we celebrate on-board around and "in" our outdoor swimming pool along with specially prepared surprise treats from the Chef. This is a signature SeaDream event that the crew looks forward to and each guest will remember. Balinese DreamBeds — Each of our yachts features the sensational Balinese DreamBeds. These, highly popular, double sun beds are on Deck 6 by the Top of the Yacht Bar and are raised above the sightline of the yacht's railings to provide unobstructed views. Large umbrellas are available to provide shade when desired. The perfect place to sunbathe, read, look out to sea, or just snooze. Should a guest prefer to sleep under the stars, SeaDream will gladly supply the pillows and a cozy duvet. The Library — An elegant library, cozy and quiet, offers a large selection of books ranging from the classics to bestsellers. Magazines, newspapers, board games and computers with internet connections are also available 24 hours a day. The SeaDream Boutique — The Boutique is open when at sea to allow guests to purchase duty free. It offers fine gifts of international name brands, sports and yacht-wear, and necessary personal items guests may have neglected to bring with them. Guests can also purchase from specially selected boutique items available on our website - www.seadream.com. Water Sports Marina — Each yacht features a large retractable water sports Marina. Guests can enjoy a variety of water sports activities including kayaking, water skiing, tubing, boarding, wave running, snorkeling, SunfishÂ® sailing or simply a swim. The Marina also has Jet Skis. The use of the Jet Skis or "Personal Watercraft" is subject to local and national rules and regulations. In many jurisdictions, personal watercraft use is either unlawful or subject to licensing. SEADREAM will continue to use Jet Ski's where legal and authorized by local and national regulations. Award-winning, Fine Dining — SeaDream's open-seating award-winning dining and service aboard either one of our yachts is a gourmet experience that has been highly rated in authoritative guides and other publications. On SeaDream, guests are able to dine both indoors and outdoors in high style with a casual ambience. The Main Dining Salon is an elegant indoor space, large enough to accommodate all guests. The menu is an eclectic combination classics and international offerings. The Maitre'd assists each guest in their preference of seating, whether in small or large group or at a table for two. Dining is also hosted in the Topside Restaurant, open to the sea breezes and views. If a couple wishes to dine privately, there are small alcoves where they may do so. During the day, fresh sandwiches may be found at the Top of the Yacht Bar and by the swimming pool. Also available is a 24-hour room service menu featuring light, healthful offerings. Finally, wide selections of specially prepared CanapÃ©s are served during cocktails in the Main Salon. The Wine Cellar — Our Sommeliers are masters of their wine cellars at sea. SeaDream wine list features many of the top Old world and New world varieties and an array of little-known, but surprisingly enticing wines that are available for purchase. The Sommeliers also pour a complimentary selection of reds and whites at lunch and dinner. Only 55 pampered couples sail on each voyage. There are 54 Yacht Club Staterooms measuring 195 square feet. 16 of the Yacht Club Staterooms can be converted to eight Commodore Club (double Yacht Club) Staterooms at 390 square feet, featuring his and hers bathrooms and dining area for 4. There is also The Owner's Suite with 450 elegantly appointed square feet features a private master bedroom and bathroom suite and a living and dining room area with a guest bath providing extra comfort for private entertaining. Based on how the staterooms are configured, our yachts can accommodate from 47 to 55 couples. Please check our website for stateroom layouts, deck plans and photos to illustrate the different accommodations. Yachting is a highly personal experience and so is our entertainment. There are no glitzy revues, no revolving stages with smoke and mirrors. There is an intimate Piano Bar, light music in the Main Salon along with first run movies and other special films in the Main Salon or by moonlight in the aft pool deck. There are CDs and DVDs available for use in the staterooms and iPods loaded with a large selection of music. Since SeaDream guests are yachting, they also find ways to entertain themselves whether indulging in the art of conversation, a quiet moment to catch up on their reading, trying their luck at the Casino, taking time for an after dinner brandy and a cigar at the Top of the Yacht Bar, or requesting a tune at the Piano Bar, there is always something or someone to share the events of the day with.